This ER diagram shows the relationship between orders, vendors, customers and products. A customer can place an order (salesorder) for products. A purchase order may only consist of products from one vendor. The download is a zipfile containing .dez files (the data model), images of the data model, and a license agreement. The .dez file contains a data model with MS SQL Server 2005 as target database. You can easily switch the target database to another database (MS Access, MySQL, Oracle, PostgreSQL,...) in DeZign for Databases. 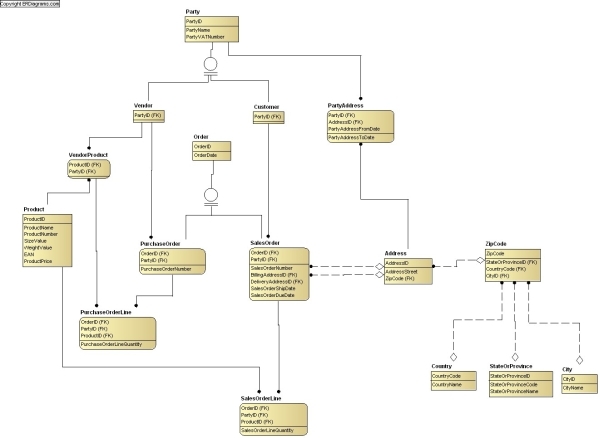 You must use DeZign for Databases to open/view/edit the data model(s) (.dez file). Please read the license before downloading this data model.